is released to DVD and VHS. music for movies, documentaries, commercials, and the animated television series Mr. Magoo. (which will open to park guests in August). The Wonderful World of Disney airs "One Day at Teton Marsh" on NBC-TV. Based on the novel by Sally Carrighar and narrated by Sebastian Cabot, this episode originally aired in 1964. Disney's Wonderful World airs "Baseball Fever" on NBC-TV. Disney Channel airs the 28th episode of MMC. Today is Anything Can Happen Day! "Walt Disney's 101 Dalmatians: A Counting Book." was first recruited by Walt Disney in 1956, as production business manager. He later served on the Company's Board of Directors and as vicepresident and administrative assistant to Roy O. Disney. As the first president of Walt Disney World Co., Tatum helped build Walt Disney World and EPCOT Center. He will be named a Disney Legend the following October. The Wildhorse Saloon, a 27,000-square-foot entertainment venue, opens at Downtown Disney Pleasure Island, Florida. The Wildhorse Saloon (located at 1630 Buena Vista Drive) sits on the former site of the Fireworks Factory restaurant. Technological Innovation are presented at Epcot. and Miss America Tara Holland takes place at America Gardens Theatre. "House of Games" and "Willie Trout." Shadow the dog) and The Boatniks (portraying Commodore Taylor - pictured right). Corrina, Corrina, Cocoon, and Trading Places. the "world's most interactive museum." Imagineers, the scientists and engineers of Walt Disney Imagineering. Actress & singer Sarah Uriarte Berrry - who starred as Belle in Disney's Broadway hit Beauty and the Beast, is born in California. She first played Belle in 1995, replacing original Belle Susan Egan (a former college room-mate). In 2006, she reprised the role of Belle in Beauty and the Beast replacing Sarah Litzsinger. Even Stevens. It is directed by Fred Savage. Original Mouseketeer Lonnie Burr is born in Dayton, Kentucky. An actor, dancer/choreographer, singer, director and author, Burr was signed to a seven-year contract by Walt Disney Studios as one of twenty-four original Mouseketeers back in 1955! U.S. men and women who lost their lives while in the military service. 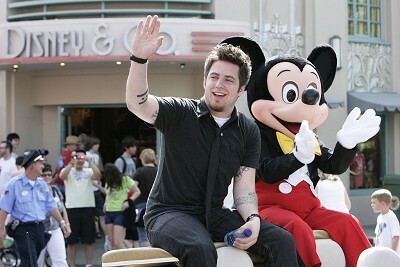 American Idol season 9 champion Lee DeWyze takes part in a special motorcade at Disney's Hollywood Studios. 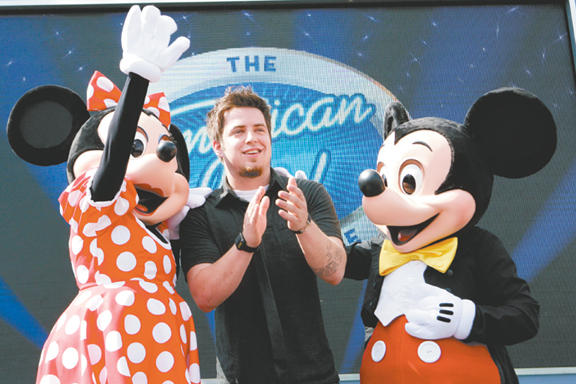 Afterwards he makes a guest appearance at The American Idol Experience. Seduction, Stevie B, and Kevin Paige. prompted the National Weather Service to use personal names to designate storms! To Be King" for The Lion King, the feature films, Lilo And Stitch and Brother Bear, the three Roger Rabbit short features Tummy Trouble, Rollercoaster Rabbit and Trail Mix-Up and the short John Henry. with Princess Fairytale Hall, a royal meet-and-greet area set to debut in 2013 as part of the redesigned Fantasyland. (Snow White isn't leaving WDW ... a new ride based on Disney's first animated feature film is coming to Florida. sections themed to four of the most popular Disney and Disney-Pixar films of the last 25 years. Actor Colin Farrell is born in Ireland. He portrayed Travers Goff (the troubled father of writer P.L. Travers) in the 2013 release Saving Mr. Banks and Holt Farrier (a former circus star) in the 2019 live-action Dumbo. dinner spot where guests can meet Chef Mickey and his pals, who make a stop at each table during dining service. Effects animator, film director, and screenwriter Mark Dindal is born in Columbus, Ohio. First working at Disney in 1980, his early credits include The Fox & the Hound (1981), The Black Cauldron (1985), Mickey's Christmas Carol (1983), The Great Mouse Detective (1986), and Oliver & Company (1988). Dindal left Disney around 1986 to briefly work on outside projects, but later returned as a visual effects supervisor for The Little Mermaid (1989). He later worked as head animator for the film The Rescuers Down Under (1990) and directed the animated segment for the live-action film The Rocketeer (1991). turning the floundering team around, just in time to make the playoffs.